She’s our sniffer dog. She helps around the office and lets us know if there’s anything not quite right… OK, so that’s not true. She’s just a puppy and she wouldn’t know suspicious if it came right up and sniffed her fluffy little behind. But we do love Nancy. She doesn’t come without her challenges though. While we’re all busy with our busy, Nancy can be found creating havoc in various degrees. So much so that we now feel fully equipped to stand up as the experts in the best ways to see off a dog in an office environment – and we’d like to share. You’re welcome. Everyone knows that dogs love a good old nap. 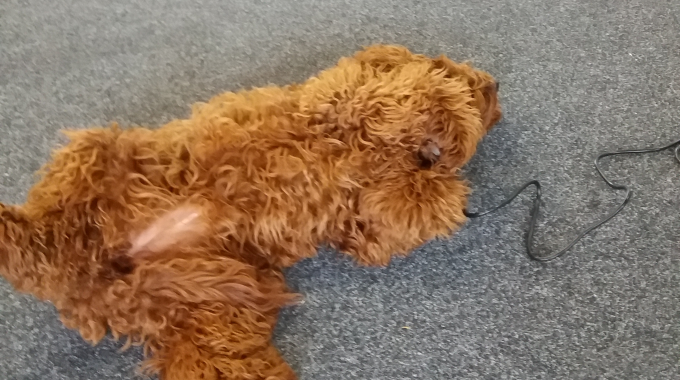 So why not make space for your office dog under your desk and make a cosy little bed out of cables. Electrical cables. Any old cable will do, as long as it’s plugged into a live socket. Printer cable, computer cable, phone charger cable. You get the picture. If your dog is anything like ours, she’ll soon have that pesky protective cover off each and every one so she can sharpen her teeth on the good stuff. She won’t even realise it was the cables that made her fur go that lovely, smoking, ash colour. She’ll think it was your feet. Then every time you go near her for the next week she’ll scamper off into a corner and hide. Job’s a good’un. Here at Low Cost Parcels, we have our own soup kitchen. I know, awesome yes? The team is always busy running around, serving our customers and going that extra mile whenever they can. But all those extra miles every day can mount up to some seriously hungry LCP folk. Hence the soup kitchen. We just love to experiment with new and exotic recipes in said soup kitchen and we take it in turns to empty out the contents of our fridges at home and bring in the ingredients for a mystery soup to feed the hordes. We’ve discovered some corking recipes too. Shout up if you’d like to hear some – we’d be happy to share. Who knew the LCP crew would become soup connoisseurs? But there’s one particular soup we’d beg you to stay away from. And we mean, seriously. Don’t go there. Stay away! It’s filthy stuff. Awful. Even the dog scampered away in disgust in a bid to save her own tiny life. You have been warned. Because dogs love a spot of ‘pick up sticks’ don’t they? Of course they do. Especially when the sticks are small enough to swallow and attractive enough to chew through. And who doesn’t want a neon yellow tongue for the rest of the day, huh? So yeah, small objects, brightly coloured and satisfyingly chewy, are a fantastic way to choke, poison or generally distract an office dog from the main job of the day – quietly napping and remaining out of the way. When you think about it, a small office bin, filled to the brim with old paper, crisp packets, glass jars, dirty hankies and apple cores has got to be one of the most exciting things to an over-confident, playful office pup. So don’t scrimp. Fill the buggers up and let the puppies dig. It saves on the expense of a shredding machine and has the added advantage that you don’t need to worry about bringing that expensive dog food to work – the pup has an all-you- can-eat buffet under every desk. And don’t worry if the hound chews up and consumes something important. You only have to wait a few hours, go out for a short constitutional and hey presto, item returned. Dogs love chocolate. It’s a well-known fact. So don’t be stingy. Let the little critter share – it’ll help your waistline as well as providing much-needed nutrition for your four-legged friend. No dogs were hurt, injured, inconvenienced, looked at in a funny manner or otherwise put at risk during the writing of this blog. We joke. It’s what we do here at Low Cost Parcels. Nancy is a pampered pooch.